That’s our program’s goal. We accomplish this goal through constant reinforcement of our Panther Tough philosophy. So what is Panther Tough? The idea of Panther Tough embodies the qualities and values that develop Edgemont wrestlers into Champions on the mat and in life. Embrace failure as a necessary step on the road to success. Focus on the process, not the outcome. Control what you can control. Today, be better than yesterday. Tomorrow, be better than today. Take ownership – no excuses, no finger-pointing, no blame. Do what you say you're going to do, when you say you're going to do it. Be a finisher – finish what you start…no quitting. Always compete with class and sportsmanship. Your actions express your priorities. Respect each other and your differences. Always serve and always protect your teammates. Consistency is the number one key to success in anything – there is NEVER a shortcut. Practice is everything. Be there everyday. Your habits dictate your ceiling. Love the process. Show it with your energy level. Take a second to appreciate the journey. Know that the best is yet to come. 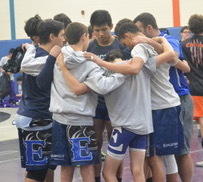 Edgemont Wrestling works to develop student-athletes who always strive for excellence, never settling for mediocrity. Success is not defined by victories or defeats but rather by personal growth and the continual effort to reach one’s potential on the mat and off. This mission is accomplished through a rigorous program, exacting standards, and a dedicated coaching staff that embodies these ideals. Please feel free to use our #PantherTough and #FeedThePanther hashtags on your social media accounts when posting about the program!